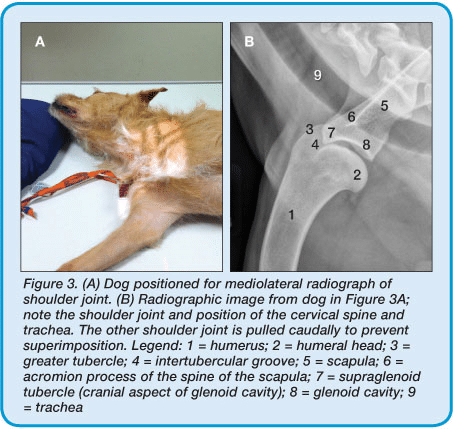 Small Animal Radiography: Stifle Joint & Crus (Mar/Apr 2012). 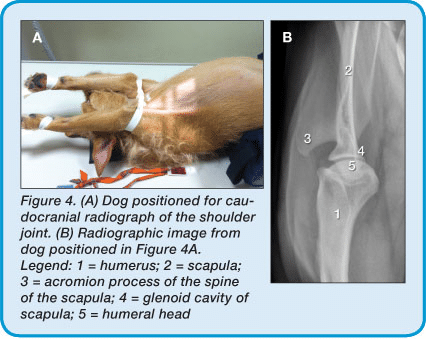 This article will review creating high-quality radiographs of the proximal thoracic limb; specifically the scapula, shoulder joint, and humerus of the dog and cat. 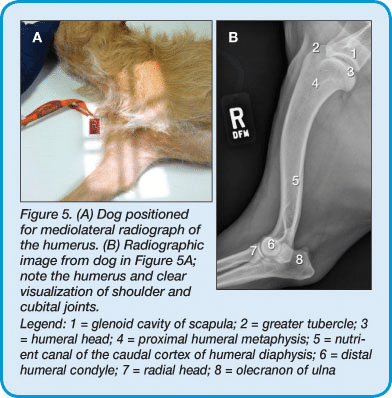 High-quality radiography encompasses the application of three areas: positioning, technique, and quality control of the final images. With advances in imaging technology (such as digital radiography), errors in actual technique (machine settings or darkroom technique) are less common; however, if anatomy is not appropriately collimated and positioning is inadequate, the imaging study is considered nondiagnostic. Sedation for an orthopedic radiographic study allows relaxation of muscles for ease of positioning and also provides pain control if the patient is painful in the areas being imaged. Thoracic limb lameness that localizes to the proximal thoracic limb. High-quality, orthogonal radiographs are required in order to provide an accurate assessment of these areas. These two types of views would be considered the minimal standard of care in veterinary medicine. 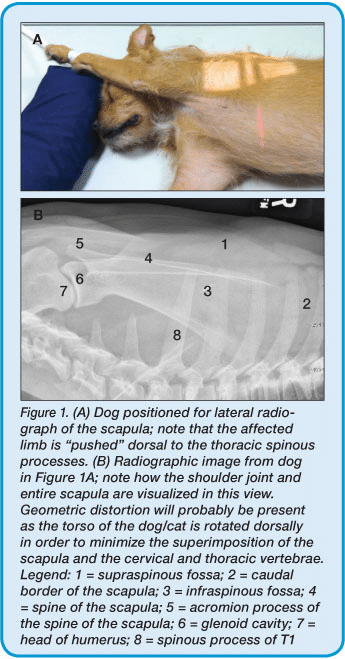 In most situations, placing the dog or cat in lateral recumbency on a 14″ x 17″ cassette and taking a lateral radiograph to evaluate the entire limb is not acceptable. Proper collimation and focused examinations are critical for high-quality radiographs and accurate interpretation. Radiographic technique is determined by a number of things, which are beyond the scope of this article. However, the techniques suggested throughout this series provide a starting point or frame of reference for obtaining a diagnostic radiograph of a given area. Darkroom technique used (if using analog film). Each of these factors present unique challenges that need to be mastered by the technician in order to optimize image quality. The focus of these articles has been related to the technical positioning of a patient rather than the factors that impact actual generation of the image (technique and development). Lateral projection of scapula: With the limb to be radiographed (affected limb) in a nonrecumbent position, the scapula is measured at the level of the cranial to mid thoracic vertebrae (thickest area over which the scapula is lying). You should be able to palpate the entire scapular spine as the affected limb is away from the table (Figure 1). Mediolateral projection of shoulder joint: With the affected limb against the table, the humeral head is measured at the level of the thoracic inlet. Mediolateral projection of the humerus: With the affected limb against the table, the humerus is measured halfway between the shoulder and cubital joints. 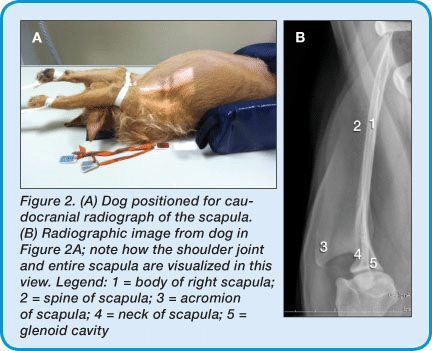 Caudocranial projections of the scapula, shoulder joint, and humerus: With the dog in dorsal recumbancy, the measurement for these three views is taken at the level of the shoulder joint in the caudal to cranial plane. Mediolateral projection: The marker is placed along the cranial aspect of the limb. Caudocranial projection: The marker is placed along the lateral aspect of the limb. For a right or left lateral image, the patient is positioned on the table in lateral recumbency with the affected side up (away from the table); then marked with a lead marker in the collimated area as right (R) or left (L). The limb not being radiographed (unaffected limb) is taped and pulled cranially and distally (away from the thorax) (Figure 1). The skull and neck are positioned ventrally with a sand bag, positioning the shoulder below the level of the thoracic spinous processes. The affected limb is taped midradius and pulled dorsally, positioning the carpus above the skull. The elbow will be flexed and, in turn, will superimpose the scapula over the thoracic spinous processes. 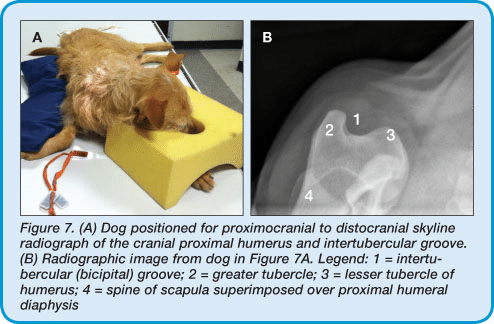 The pulling of the unaffected limb and pushing of the affected limb will rotate the torso of the dog or cat, resulting in the affected scapula being positioned dorsal to the cervical and thoracic spinous processes. The cranial edge of the collimator light is placed cranial to the distal margin of the spine of the scapula. The caudal edge of the collimator light is placed at the caudal border of the scapula. The collimation is opened dorsal and ventral to include the entire scapula. For the orthogonal view, the scapula is imaged in a caudal to cranial direction. The patient is placed in dorsal recumbency with each thoracic limb taped separately and pulled cranially, as in a ventrodorsal thoracic view (Figure 2). If the elbows abduct (move lateral to the midsagittal plane or midline), a band of tape is placed at the level of the mid antebrachii in order to pull them medially, allowing the olecranon to point straight up toward the x-ray tube. This will ensure that the scapula and humerus are straight in a proximal to distal direction. 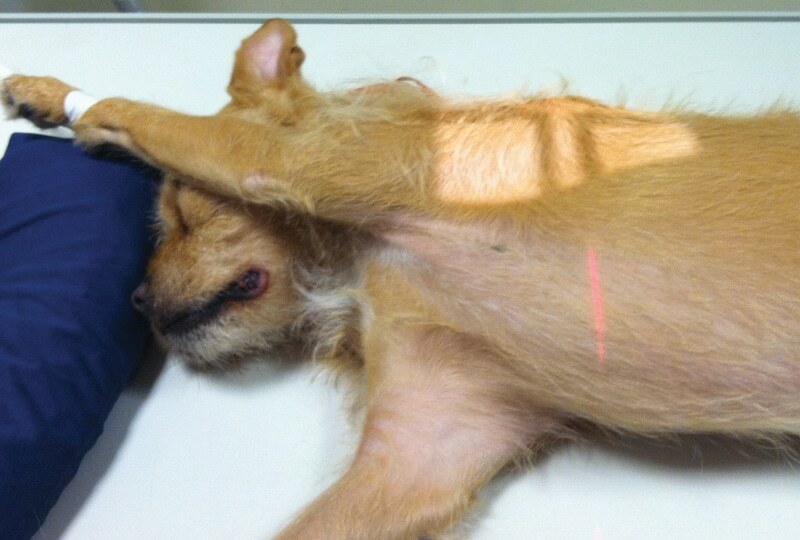 The scapular spine is palpated laterally on the dog or cat. The cranial edge of the collimator light is positioned 1 inch cranial to the acromion process of the spine of the scapula. The medial collimator margin is half way between the skin surface and the sternum. The lateral collimator margin is positioned just lateral to the skin surface. The radiopaque marker is placed along the lateral aspect of the skin at the level of the scapula. For a right or left mediolateral image, the patient is positioned on the table in lateral recumbency with the affected side down and the lead marker is placed within the collimated area as right (R) or left (L). The thoracic limbs should be taped separately with the affected limb pulled cranially and distally away from the animal’s neck.The unaffected limb is pulled caudally and taped so that it lies along the lateral thoracic wall (Figure 3). The patient’s head and neck are positioned dorsally to avoid superimposition of the cervical spine over the shoulder joint. A sandbag is placed over the cranial cervical spine outside the area of collimation. This sandbag can be used to keep the patient’s head still and out of the field of view (FOV). The thoracic inlet is palpated first; then your fingers move cranial to the shoulder joint of the affected limb. The center of the collimator light is placed at this point. The FOV is collimated so it includes the distal third of the scapula and the proximal third of the humerus. The radiopaque metal marker (R or L) is placed cranial to the shoulder joint in the field of collimation. For the orthogonal view, the shoulder joint is imaged in the caudal to cranial direction. The patient is placed in dorsal recumbency with each thoracic limb taped separately and pulled cranially, as in the caudocranial image of the scapula (Figure 4). If the elbows abduct, a band of tape is placed at the level of the mid antebrachii to pull them in medially, allowing the olecranon to point toward the x-ray tube. This action will straighten the scapula and humerus in a proximal to distal direction. The indent between the humeral head and distal end of the scapula (or scapular spine) is palpated laterally and indicates where to place the crosshairs of the collimator light. The FOV will include the distal third of the scapula and proximal third of the humerus. The medial and lateral margins should extend from the thoracic inlet to the skin margin, respectively. The radiopaque marker is placed lateral to the skin to prevent superimposition over any part of the anatomy being radiographed. For a right or left mediolateral image of the humerus, the patient is positioned on the table in lateral recumbency with the affected side down (Figure 5). The thoracic limbs should be taped separately with the affected limb pulled cranially and away from the neck and the unaffected limb pulled caudally along the thoracic cavity. The skull and neck should be pushed dorsally. A sandbag can be used to keep the head in position and out of the FOV. Depending on the thoracic limb being imaged, a lead marker is placed in the collimated area as right (R) or left (L). The center of the collimator light should be placed in the middle of the humerus (craniocaudal and proximodistal directions). Skin margin, in a cranial and caudal direction. For the orthogonal view, the humerus should be imaged in a caudal to cranial direction. The patient is placed in dorsal recumbency with each thoracic limb taped separately and pulled forward similar to a ventrodorsal thoracic view (Figure 6). If the elbows abduct, the limbs are held in place by elastic tape at the level of the mid radius to the limbs medially. The center of the collimator light is placed in the middle of the humerus (mediolateral and proximodistal directions). Skin margin laterally to the level of the axilla, in a medial direction. This projection is used to image the biceps tendon in the intertubercular groove and the greater tubercle of the proximal humerus. The patient is placed in ventral recumbency with the pelvic limbs placed in the opposite direction of the limb being radiographed (Figure 7). The skull is positioned to the side away from the affected limb. The limb is flexed at the elbow and pulled caudally to the shoulder joint. The radius and ulna are abducted away from the shoulder joint in question and care is taken to make sure the cubital joint and humerus are aligned with the shoulder joint, but not superimposed. Palpate the intertubercular groove and place the center of the FOV at that point. The FOV should be small and the collimated area only should include the proximal humerus and surrounding soft tissues. This limited collimated area will decrease the amount of scatter radiation (personnel exposure and film fog). Osteochondritis dissecans (OCD) is an abnormality of the normal endochondral ossification process of the articular and epiphyseal cartilage. OCD can affect a variety of synovial joints, such as the elbow, stifle, tarsus, and, commonly, the shoulder joint. Pronated and supinated projections are used to image the caudal aspect of the head (epiphysis) of the humerus, where OCD lesions typically occur. The patient is placed in lateral recumbency and positioned in the same manner as a mediolateral projection of the shoulder joint. For the pronated view, a triangle-shaped sponge is placed under the cranial aspect of the radius to rotate the antebrachium and carpus externally (Figure 8A). For the supinated view, a triangle-shaped sponge is placed under the entire cubital joint to rotate the antebrachium and carpus internally (Figure 8B). Is the appropriate anatomy present within the image? Is the patient correctly positioned? Caudal border of the scapula. Due to anatomic limitations, in the lateral view of the scapula there will be some degree of overlap between the thoracic spinous processes and ventral border and infraspinous fossa of the scapula. The trachea should be superimposed over the distal portion of the scapula, not the shoulder joint or humeral head. Proximal third of the radius and all aspects of the cubital joint. Burk RL, Feeney DA. Small Animal Radiology and Ultrasonography: A Diagnostic Atlas and Text, 3rd ed. Philadelphia: Saunders Elsevier, 2003. Kealy JK, McAllister H, Graham JP. 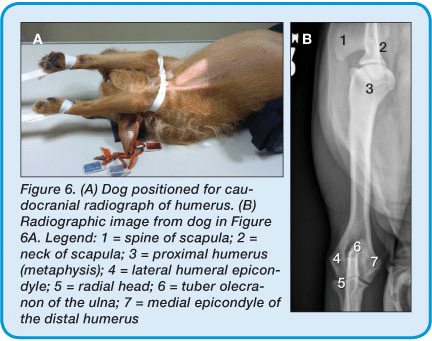 Diagnostic Radiology and Ultrasonography of the Dog and Cat, 5th ed. Philadelphia: Saunders Elsevier, 2011. 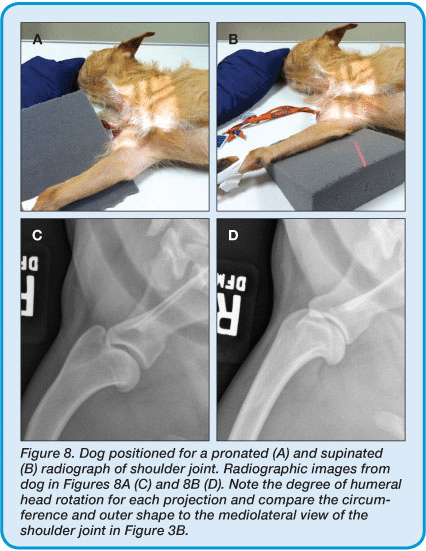 Sirois M, Anthony E, Mauragis D. Handbook of Radiographic Positioning for Veterinary Technicians. Clifton Park, NY: Delmar Cengage Learning, 2010. Thrall DE (ed). Textbook of Veterinary Radiology, 5th ed. Philadelphia: Saunders Elsevier, 2008. Thrall DE, Robertson ID. Atlas of Normal Radiographic Anatomy and Anatomic Variants in the Dog and Cat. Philadelphia: Elsevier Saunders, 2011. Danielle Mauragis, CVT, is a radiology technician at University of Florida College of Veterinary Medicine. She teaches veterinary students all aspects of the physics of diagnostic imaging, quality control of radiographs, positioning of small and large animals, and radiation safety. Ms. Mauragis coauthored the Handbook of Radiographic Positioning for Veterinary Technicians (2009) and was the recipient of the Florida Veterinary Medical Association’s 2011 Certified Veterinary Technician of the Year Award. This award recognizes an individual for the many outstanding contributions that person has made to the overall success of the veterinary practice operated or staffed by an FVMA member veterinarian. Clifford R. Berry, DVM, Diplomate ACVR, is a professor in diagnostic imaging at the University of Florida College of Veterinary Medicine. His research interests include cross-sectional imaging of the thorax, nuclear medicine applications in veterinary medicine, and biomedical applications of imaging in human and veterinary medicine. Dr. Berry has been a faculty member at North Carolina State University and University of Missouri. He received his DVM from University of Florida and completed a radiology residency at University of California–Davis.